Yup, all your scripts are now in your pocket. 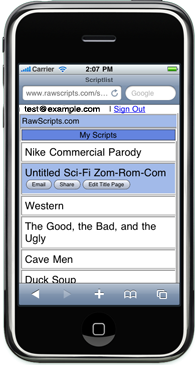 Starting today, you can mange you scripts from any iPhone, Android, or Blackberry device with a modern browser. So, you're in a production meeting and want people to annotate the script online? 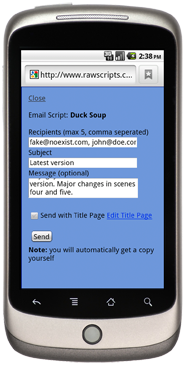 Share the script from your phone. At a party and found someone perfect for a role? Send them the script on the spot. You can start using these features immediately, and keep an eye out for more on your mobile phone. Lots lots more to come.